At first glance, school-based mentoring is the perfect design to support children in Moab. Young mentees thrive under the care of their mentors. Other students regularly approach program staff to ask, “Can I have a mentor?” They see their at-risk peers spend time with kind adults – shooting hoops, solving Rubik’s cubes, doing science fair projects, playing Life, reading, sewing, and cooking. Mentoring is cool, a coveted privilege. Youth engagement never stagnates at the elementary school, and that’s why many more children want to be mentored than the program can (or should) enroll. Then adolescence arrives. With puberty, teens embark on a delicate journey toward autonomy. Naturally, they begin reaching for independence and a sense of identity that looks more adult-like. Hanging out with an adult at school isn’t as comfortable as it once was. Students sense a shift in themselves and become more sensitive to the judgment of maturing classmates. The forces of social and emotional development often derail school-based mentoring because placematters a great deal. Rather than cutting these vulnerable teens adrift in adolescence, Grand Area Mentoring seeks to sustain relationships through what often proves to be a difficult and defining period – middle school and high school. The support of mentors can be even more important than it was in early childhood. 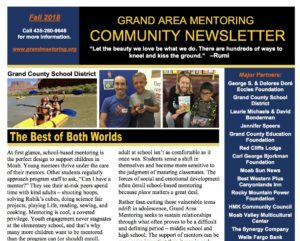 To capitalize on the momentum created in elementary school, Grand Area Mentoring now allows veteran volunteers & adolescents to engage in one-on-one, community-based mentoring. In September, the program trained fourteen mentors to work with mentees at approved sites throughout Grand and San Juan Counties. Those sites include Grand County Public Library, KZMU, Moab Animal Shelter, Moab area businesses or educational institutions, restaurants, hiking trails, city parks, national parks, and more. It is developmentally appropriate to provide greater freedom and responsibility to these children. Community-based mentoring broadens horizons beyond campus. This community-based mentoring project is based onUtah’s Seventh District Court’s mentoring program, The Village Project. Policies and procedures were carefully adapted and strengthened with the assistance of Principal Taryn Kay, retired supervisory ranger Karen Schlom, former superintendent Margaret Hopkin, Mark Shapiro, and Lynn Anderson. After thorough review, Super-intendent JT Stroder gave it the green light. Feedback from youth and mentors has been promising. Upon training, many middle and high school youth say they’re excited about this enhancement. Mentors have universally appreciated the new online mentor logs made possible by a grant from WabiSabi and the support of AWebStudio. Outings have already run the gamut from Sweet Cravings restaurant to the movie theater to the Fiery Furnace in Arches National Park and beyond. If childhood is a great time to start new relation-ships and if adolescence an important period to sustain friendships, this design may provide the best of both worlds. Mentor on, friends!